The latest from writer-director Armando Iannucci, The Death of Stalin is a political satire that takes place in Moscow in 1953, and mostly unfolds following the death of dictator Joseph Stalin (Adrian McLoughlin), leaving Party Head Nikita Khrushchev (Steve Buscemi) trying to plan a funeral as Georgy Malenkov (Jeffrey Tambor) prepares to take over the Soviet Union. 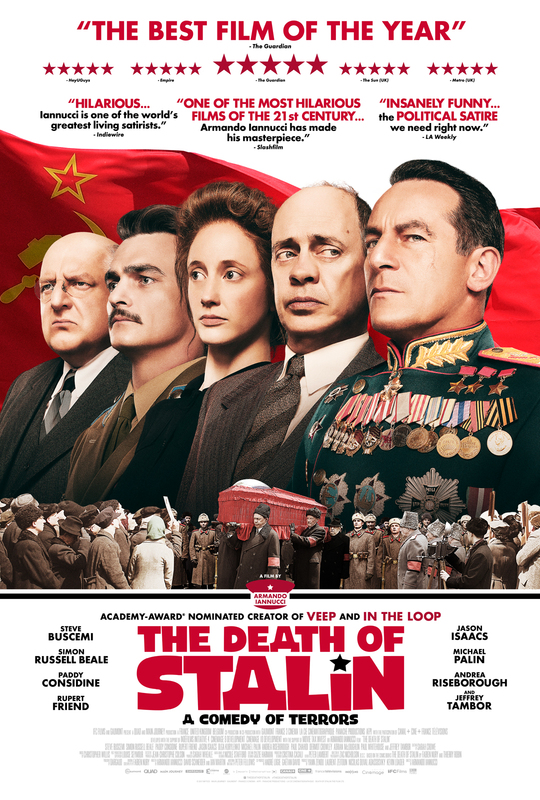 Although based on a graphic novel of the same name by Fabien Nury and Thierry Robin, the tone of The Death of Stalin will be immediately familiar to any viewers who have seen Armando Iannucci’s previous feature In the Loop or know the style of his work from the TV show Veep. Like his previous works, this is an extremely dry and mostly dialogue-driven comedy that reduces political figures to bumbling idiots, as they desperately try to take control of an increasingly convoluted plot. Because The Death of Stalin is based on real events from a dark time in history and is satirizing a murderous, tyrannical regime, it obviously needs to walk a very narrow tonal tightrope, and for the most part it works and does deliver some twisted laughs. This is ultimately a solid and well acted mix of political satire and dark comedy, that fans of Armando Iannucci’s work are sure to enjoy. The Death of Stalin is now playing in limited release at Cineplex Cinemas Varsity in Toronto.